In no particular order, here are a number of other Oregon Pinot Noirs I sampled recently. As you have probably surmised from the previous notes, there is basically a two-tier system for Oregon’s Pinot Noirs. 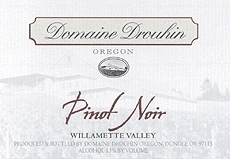 Most wineries produce a Willamette Valley or Oregon blend which is an entry level Pinot Noir that provides excellent drinking for the money (usually priced in the $17-$27 range). A step up in quality, complexity, and interest are the reserve wines and vineyard-designate bottlings which can be quite expensive. The point is, there is good drinking at every price point. 14.5% alc., 450 cases, $30, screw cap. The label jokes, “Life is good, the palate is pleased, and the rooster crows again.” · Lightly colored. Attractive scents of cherries, raspberries and wood spice. The flavors replicate the aromas with notable oak influence. Lively acid on the refreshing finish. 13.9% alc., $21. · Cherry, oak and barnyard scents with the oak carrying through to the finish. Very light in body, even shallow in fruit with a clean but stem-infused finish. 12.5% alc., $24. · Sweet and floral scents with some farmyard and animale. Succulent blue and black fruits, tangy acidity and commendable balance. 13.5% alc., $26. · The oak jumps out in the nose and dominates the wine throughout. A dark and one-dimensional fruit-driven wine with significant drying tannins on the finish. 13.5% alc., $32. · I could not warm up to the aromatics that showed pomegranate, green leaf and oak char. Appealing blue and black fruits, good balance, and a slightly dry finish. 14.2% alc., $38. · The aromatics blossom with coaxing to reveal deep cherries, violets and vanillin oak. Very elegant in style with charming spiced red fruits, soft texture and diaphanous finish. I like this a lot for its Vosne-Romanee character. 13.5% alc., $40. A family- owned and worked winery. This wine comes from a 7 acre distinct block of the estate vineyard. · Black cherries, Asian 5 spice and pencil shavings make up an interesting nose. Slightly jammy and simple fruits with a very healthy tannic backbone. I would lay this one down a few years. 13.5% alc., 800 cases, $43. A blend of fruit from the Dundee Hills (70%), Chehalem Mountains, and Eola-Amity Hills. The name Deux Verres means “Two Glasses” in French. Winemaker is Jacques Tardy. · Red Pinot fruits power this wine from start to finish. Bright, sweet cherries are the star and pie crust accents fill in. A bit austere and simple but admirable acidity and a soft landing on the finish. 13.9% alc., $45. · Fruit plays a minor role in the nose which shows noticeable oak, earthiness, and mineral- imbibed red cherries.. Demure red fruits are simple with plentiful oak, a strong tannic backbone, soft mouth feel and an acid kick on the backend. Not yet up to the high level of the 2004 vintage of this wine. 13.5% alc., $45. Note: Van Duzer has had Brett in their wines and it has been part of the Van Duzer ’style,’ especially in the 2002, 2003 and 2004 vintages. In 2004, the Brett aromas were initially masked by the intense fruit, but with time as the fruit intensity dissipated, the Brett became obvious. I believe the problem was curtailed in the 2005 vintage and will be eliminated from the 2006 vintage on when the wines are produced in a newly constructed winery. Although there was no typical Brett aromas in the above wines, the aromatic profiles were a bit unusual and some may find them off-putting. That said, the wines are drinking quite nicely now. · Darkest in color of the three Van Duzer wines. The aromatics are strange, if not unpleasant showing some reduction with vanilla and floral notes and an unidentified chemical component. The dark fruit flavors, however, are luscious and layered, rich but not cloying. Acidity and tannins are reigned in and the whole package is nicely balanced. 13.5% alc., $45. · Similar aromatics as above, very floral with added earthiness. Black cherries and black raspberries are a bit tart and the tannins are forefront. The mouth feel is soft and inviting. 14.0% alc., $48. Composed of five estate vineyards from the 65-acre estate in the Eola Hills. · Entry is different and interesting featuring baked cookies, pumpkin spice and black cherries. This Pinot is cherry fruit-driven with a subtle oak thread running throughout. Very appealing for its finesse and earthiness. Dare I say Burgundian? 13.7% alc., $48. · Hi-tone red cherry fruit of great purity in the aromatics with a hint of red licorice. Lovely and understated arsenal of cherry fruit, a suave texture and brisk acidity on the finish. A sophisticated wine of great breeding. Still some unresolved tannins - give it 6-12 months to soften. Tres Pinot. 13.9% alc., $50. Cheryl Francis and Sam Tannahill craft this winemaker-designated cuvee. · Deep, dark ruby color. This is a dark, brooding style of Pinot Noir. Black fruits (plum, blackberry), earth and minerals are evident from start to finish. Full-bodied and straight-forward with a velvety texture. Fans of a bold, plush style will find interest in this wine. 13.7% alc., $75. · Deep, dark nose with penetrating plum, black cherry and oak perfume. Packed with tangy and plumy fruit, integrated tannins and brisk acidity on the finish. At present there is more earth and wood than fruit in the aftertaste. Muscular but not harsh. Excellent but not profound. 14.1% alc., $65. This wine is made from the finest lots of grapes from Drouhin’s 225-acre estate. It is named after Veronique Drouhin’s oldest daughter. The first vintage was 1992. · Not offering a lot on the nose yet with shy black cherry and wood spice. Solid mélange of black stone fruits with fine-grain tannins. Plenty of French sensibility and the structure to develop nicely over the coming years. Terrific potential that will reward patience. 13.0% alc., $25. Winemaker Jason Lett. · Unusual scents of mushroom and sherry. Medium ruby in color and light in weight, the elegant flavors are complex featuring strawberries, leaf, cigar box and sherry. An atypical Pinot Noir that is already showing secondary characters and is not for everyone.